In large skillet, place shrimp in single layer. Add beer, garlic and salt. Turn heat to medium-low and slowly poach shrimp, turning while cooking until cooked through, about 6 to 8 minutes. Remove shrimp to bowl with slotted spoon. Chill shrimp in refrigerator. Boil poaching liquid and garlic about 6 minutes, or until reduced to ¼ cup. Pour liquid into small bowl; mash garlic into beer reduction with a fork. Cool. Stir in chiles, adobo sauce, mayonnaise, chili sauce, lime juice and chives. Chill. To serve, line plates with lettuce leaves. 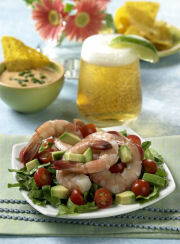 Top with shrimp, avocado and tomatoes. Serve with chipotle cocktail sauce and Tortilla chips.